ATV128 is the big brother to the ATV88. These super-light trailers tow beautifully. The ATV128 handles three full-size quads. 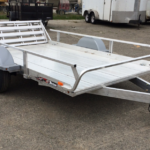 With Johnson’s aluminum wheel chocks you can carry 6-8 dirt bikes on this trailer. Loading and unloading your ATVs is a breeze. 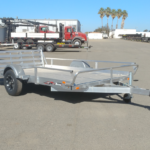 They can be loaded from the side or the back: just pull out the aluminum ramp that’s stored in the back of the trailer, under the deck in a rattle-free, lockable storage rack. Set the ramp on the side rail and drive your ATV up the ramp. The extruded aluminum side rails have integrated slots with sliding tie-downs that can be moved and secured into any position – front to back. The deck is marine grade plywood that comes with a lifetime warranty against de-lamination.